The Riviera city of Menton celebrates the opening of its annual Music Festival, the oldest and most prestigious in Europe, on July 31st. 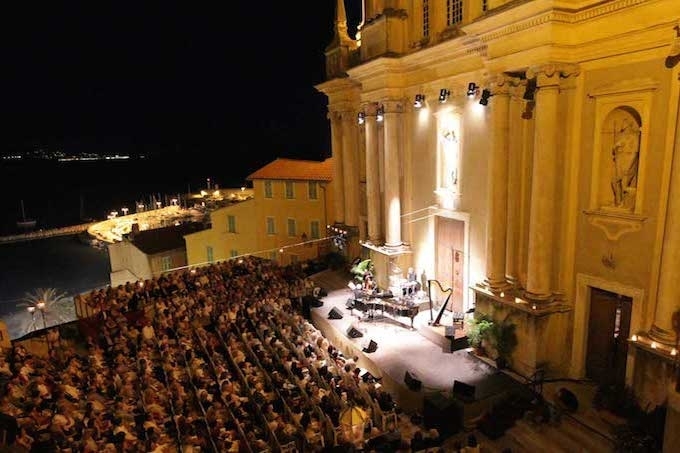 The Festival de Menton has been attracting some of the world’s greatest classical artists for over 60 years, and this year’s programme – the 65th – is no exception. From the Square of the Basilica de Saint-Michel Archange, to the Musée Cocteau collection Séverin Wunderman and the Esplanade Francis-Palermo, a wide range of programmes will delight the many music lovers who’ll be gathering in the beautiful city known as La perle de la France. It was on August 12th, 1949, that one André Böröcz was invited by a friend to visit Menton. Standing in the Square of the Basilica, he heard the strains of a Bach violin partita, played by Jascha Heifetz, wafting through the late afternoon air from radio on a windowsill. Böröcz was so overcome by that magical experience, that he was determined not only for it to live on, but that it should be shared with others as well – and thus was the Festival de Menton created. The Square of the Basilica, overlooking the Mediterranean, is the elegant baroque setting for the concerts of Les grands interprètes. The line-up of illustrious artists includes Gidon Kremer and his Kremerata Baltica (pictured above), Renaud Capucon and Nicholas Angelich, Nelson Freire, Sol Gabetta – and, on a lighter note – Igudesman and Joo present their combination of classical music and comedy in A Little Nightmare Music. The chamber series, Les concerts de 18h, takes place in the Musée Cocteau collection Séverin Wunderman, and includes recitals by pianists Benjamin Grosvenor and Yevgeny Sudbin, and Christophe Rousset on the harpsichord. The opening concert of the Festival is a performance by Quintette Quai n°5 with the intriguing title Et si Mozart, Bach, Verdi, Malher avaient été cubains, tchèques, américains ou brésiliens? It’s the first in the series Le festival off, which will be held on the Esplanade Francis-Palermo. Also featured in this series are performances by trumpeter Romain Leleu with L’Ensemble Convergences, and Monaco Brass. The Festival closes on August 14th with a mass in the Basilica Saint-Michel Archange by baroque instrumental ensemble La Magnifi ca Comunità and soprano Simone Kermes. Crazy Week – the Festival that Kept On Giving Until the Very End!